At 99.9 percent efficient, the Vent-Free Vail Fireplace delivers more heat for your energy dollars – 32,000 Btu for the Vail 32 and 36,000 Btu for the Vail 36. Ceramic glazed pellets in the burner tumble and swirl the gas to produce a natural flickering flame. The Vail 24 delivers the beauty of hand-painted ceramic fiber logs and natural flickering flames to dens, halls, and even bedrooms. 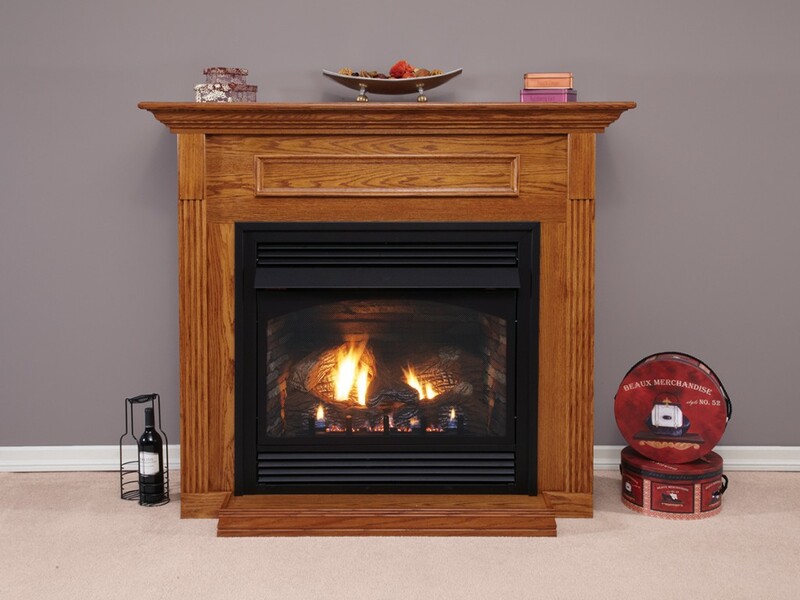 The Vail 26 Special Edition is the American-made fireplace system that ships complete in one package, and is also offered as a separate fireplace – perfect for built-in and custom mantel applications. Choose louvers in slat, arched, and mission – finished in matte black or hammered pewter. Matching door sets and frames. 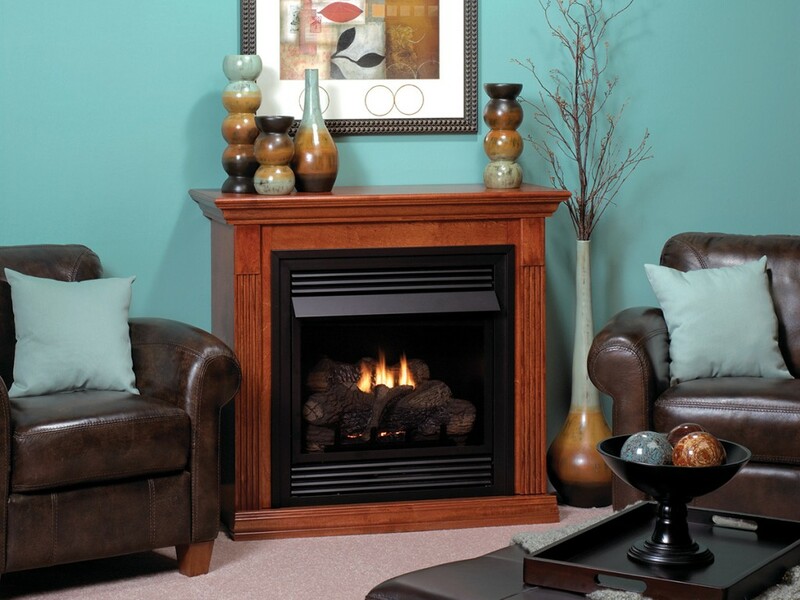 Vail 24 Fireplaces are rated at 20,000 Btu – enough heat to keep a family room cozy and warm. Special 10,000 Btu models are available in Millivolt and Intermittent Pilot for bedroom installations, where allowed by local codes. 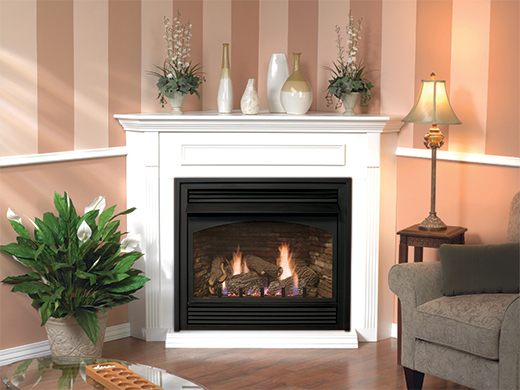 The Vail 24 fireplace includes matte black louvers and frame. Available accessories include louvers and metal frames (in hammered pewter), blowers, brick liners, remo­te controls, and Standard Cabinet and Corner Mantels (in cherry, dark oak, oak, unfinished hardwood, unfinished oak, and white). of our standard cabinet or corner cabinet mantels, available in five finishes – cherry, dark oak, nutmeg, oak, and white – plus unfinished hardwood or oak. The 10,000 Btu Millivolt and Intermittent Pilot versions may be installed in bedrooms, where allowed by code. 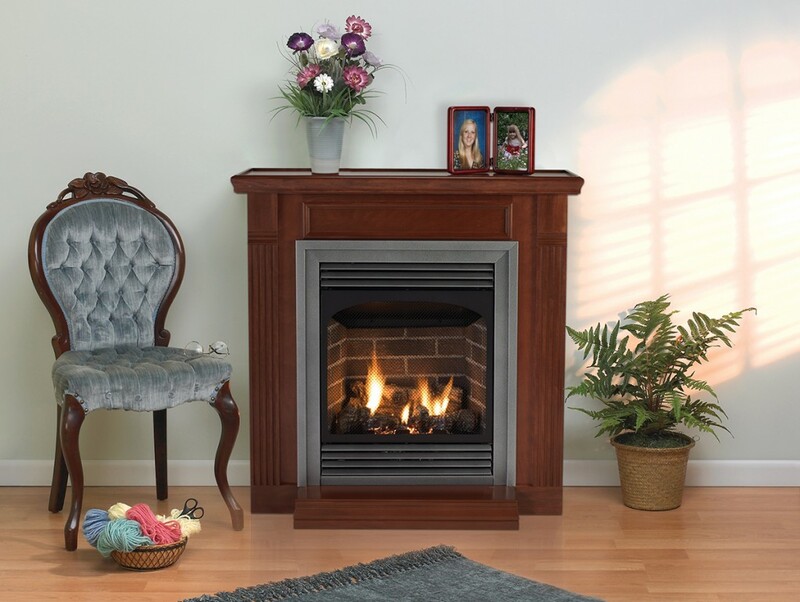 The Vail 26 Special Edition is the American-made fireplace system that ships complete in one package – fireplace, assembled mantel, Flint Hill log set with 20,000 Btu vent-free Contour burner, matte black hood, frame and louvers – even glowing embers. This package system installs in as little as 30 minutes, minimizing labor costs. A total mantel footprint of just over 17 by 45 inches makes the Vail 26 Special Edition ideal for tight spaces and small rooms. The Vail 26 Special Edition is available in three mantel colors – nutmeg, cherry, and white – and in modulating hydraulic thermostat and Millivolt control. The Millivolt system allows you to add a wall thermostat, remote control, or thermostat remote control. The Vail 32 and 36 Premium Vent-Free Fireplaces feature hem-bent seams that provide a better seal while elimi­­nating dozens of screws and fasteners. The result is a lighter, more rigid box that’s easier to install. Choose one of two liners – aged brick or stacked limestone to complement your decor. At 99.9-percent efficient, the 38,000 Btu Vail vent-free multi-sided system is the ultimate supplemental heat source for any home. 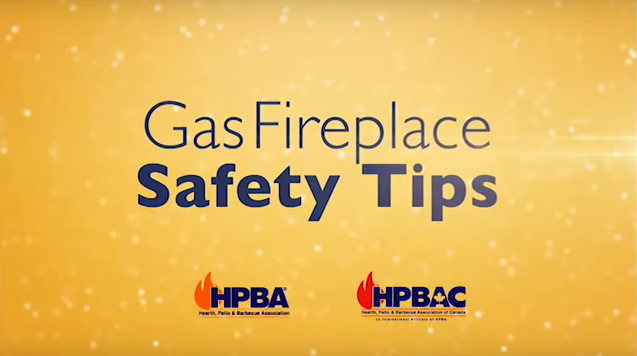 This clean-burning fireplace employs oxygen depletion sensor technology to continuously monitor your room air and instantly shut off the gas well before oxygen drops to an unsafe level. Vail systems include a built-in 24-inch Slope Glaze Vista Vent-Free Burner, arched frames with fixed screens, Banded Brick Liner, and glowing embers. The 24-inch Rock Creek refractory log set must be ordered to complete the fireplace.